In the penultimate part of our WordPress series, we will now be turning our attention towards WordPress themes. 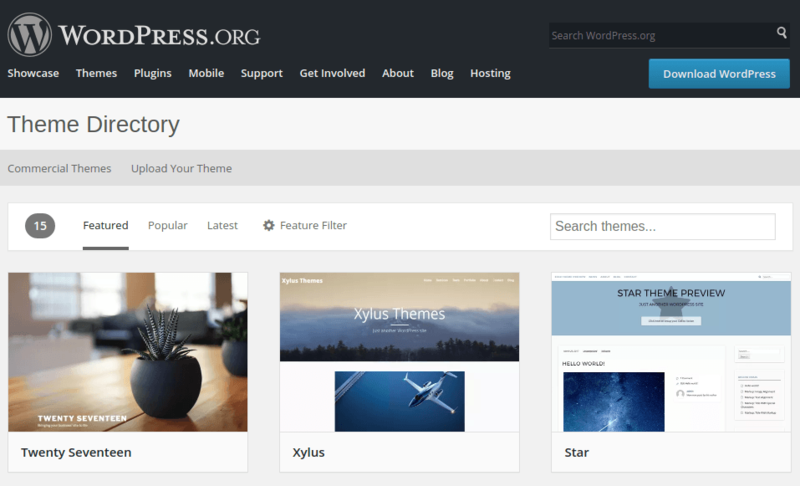 What makes a good WordPress theme and where can you find one? This article will answer the question in detail. A WordPress theme is the template that decided how your WP site or blog looks on the front-end. As such, it is the visible section of your site and should therefore be carefully chosen. Depending on your preference in design as well as the genre of your site, you can pick from the thousands of free and paid WordPress themes out there. First up, where do you get the WordPress theme from? The choice, ideally, is very simple. If it is a free WordPress theme, you should never look anywhere other than the official WordPress repository. On the other hand, for premium themes, you can look at reputed theme marketplaces such as ThemeForest and Creative Market. You can also purchase directly from theme developers — just be sure to check the developer’s reviews before buying. Pretty much like web hosting providers, theme developers too earn a reputation that can be good or bad on the basis of their performance. As such, a simple Google search for 10 minutes can save you hours of trouble later on. The list of features that you need depends on the nature of your website. For example, a minimal WordPress theme with support for image galleries might be apt for a photography site, whereas you may need custom page templates and more for a magazine site. However, irrespective of the type of site that you are running, your WordPress theme should receive regular updates and security fixes. If it is a premium theme, make sure you ask the developers about their update policy — some themes come with a lifetime of free updates, whereas others are good for just the first year wherein you have to renew the license. Never run an obsolete or out of date WordPress theme! Once you have finalized and installed a WordPress theme, give it a test using the Theme Check plugin. This free WordPress plugin checks your WordPress theme’s code against the latest coding standards. Any obsolete function calls, hard-coded links, as well as security issues are highlighted. If the scan yields way too many suspicious results, your theme is not really good. All free themes in the official repository are already checked for quality of code, so you need not check them again. However, all external premium themes should always be given a Theme Check scan before being put to use. For the most part, the Theme Check plugin will inform you about the quality of code as well as any obsolete methods that the theme makers might have employed. However, there are certain practical considerations that you should be aware of as well. For instance, any WordPress theme that insists on installing multiple WP plugins in order to properly work is not worth the trouble. Having several active plugins will surely slow your site down — a theme that works out of the box is a better choice. Similarly, a good WordPress theme is one that lets you preview all the changes in the Live Customizer itself, before you actually activate it. If your WP theme requires you to first activate it, then set it up, and then see the changes live — you should consider seeking an alternative if possible. A well-optimized WordPress theme is one that is not bloated. The biggest cause of theme bloatware nowadays is the bundled software. A good number of WP themes in marketplaces such as ThemeForest tend to come bloated with external plugins, such as page builders, in order to work properly. This means a theme that should otherwise be 3 MB in size becomes 25 MB. Naturally, if you are on a shared hosting plan, your site can slow down due to such themes. Similarly, many poorly optimized and planned WP themes tend to encroach upon plugin territory nowadays. Such themes take care of SEO, shortcodes, social sharing, and other features for you. While it is a fancy thought to have a WordPress theme that handles it all for you, what if you change that theme three years from now? Your social share counts will be gone, your SEO metadata will also be lost, and your shortcodes will no longer work. Such features, ideally, belong to WP plugins. Now that we have seen the traits of a good WordPress theme, let us discuss some basic issues that a bad WP theme might exhibit. It means there is a high chance the issue might be related to your WordPress theme. The most obvious guesses are either a plugin compatibility issue with the theme, or several recursive function calls by the theme itself. If it is the first case, you can try disabling your plugins and then enabling them one by one. However, if the slow page loads and errors are due to poorly planned function calls, your theme’s code is below par. WordPress is a free and open source software under the terms of the GPL. This means any product that seeks to extend WordPress — be it themes or plugins — has to be GPL-compliant. While media elements (say, animations and graphics that are part of your theme) are exempted from this, the theme’s code is not. You are free to modify your WP theme the way you wish to; if your theme makers forbid you from doing so, they are violating GPL and their theme is surely not something you should use. An example of this would be “as per our ToS, you are not allowed to remove our link from the footer”. That concludes our WordPress series. We have learned how to optimize and secure WordPress, improve our site’s SEO as well as how to distinguish a good WordPress theme and plugin from the bad ones. As a bonus, however, we will have a concluding part to this series wherein we discuss how to recover a hacked WordPress website. Continuing in our WordPress series, we will now turn our attention towards WordPress plugins. If you have missed the previous installments of this series, you can find them here: initial optimization steps, WordPress security and WordPress SEO. With that said, we know that a WordPress plugin can be used to extend the functionality and features of WordPress. If you have been an active user of WP, you might already have installed multiple plugins to handle SEO, security, as well as various other features for your website. But what separates a good plugin from a bad one? You can find numerous free and premium WP plugins for the same type of task — how do you find out which one is the right one? Also, is there such a thing as “too many WordPress plugins”?